Educents Giveaway ~ Perfect For Homeschoolers! You are here: Home / Giveaways / Educents Giveaway ~ Perfect For Homeschoolers! I have joined a few of my blog friends to bring you this great giveaway from Educents! If you are a homeschooler or been weighing your options as to if you want or are able to homeschool, then this is perfect for you! Teaching begins at home, no matter what the age, lifestyle, family size and more. Educents is perfect for homeschoolers all over. Utilizing the ‘strength in numbers’ approach, Educents seeks to change the status quo of how educational materials will reach those wanting to learn. 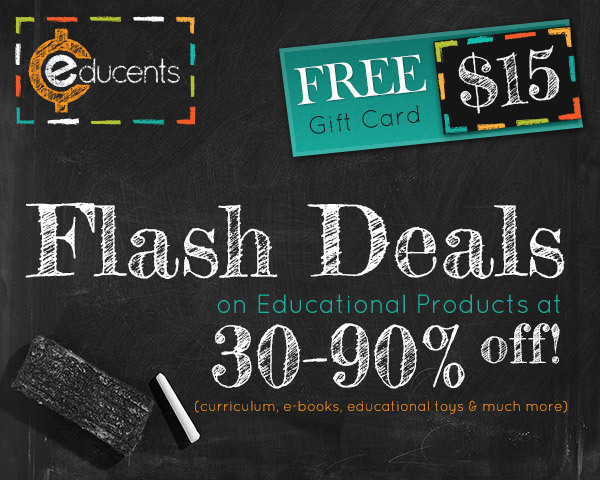 Educents is the only educational flash sale site that offers the latest Educational teaching and learning materials at a discounted 30-90 % off! And the best part? Sign up today for a complimentary $15 gift card just for pre-registering! Educents is launching April 2nd so get signed up now to score your $15 Gift Card. Connect with Educents on facebook and twitter for all your educational teaching and learning needs. Disclosure: This is a sponsored Giveaway by Educents. Participating Blogs are not responsible for prize fulfillment. Winner will be emailed within 48 hours of giveaway ending and will be announced publicly on giveaway page. I love that there is a daily deal site offering items like this! I would love to see some workbooks & study guides for “older” grades. I seem to be able to find things for 7th grade & under, but anything above that is very difficult to find.